How is body odour usually treated? How has DeodoRite helped others? How do I use DeodoRite? We have all experienced body odour at some time in our life - whether it was after sweating through a particularly strenuous game of sport or wearing a certain pair of shoes that always seem to cause smelly feet! Body odour can be unpleasant as well as embarrassing and, for some people, it is a constant worry. Though most people think of body odour as being caused by perspiration, there is more to the problem than this. Body odour is actually produced by a combination of anaerobic bacteria and products excreted from your body during exertion or periods of raised metabolism. Moisture and the secretions of apocrine sweat glands promote the growth of these bacteria on the skin which result in an odour. Perspiration itself has no particular smell. The smell of waste products excreted by our bodies is also affected by toxins we have ingested or absorbed into our bodies. In a modern environment our bodies are subjected to a host of chemicals and toxins in our food - including pollution in the air and even household cleaning products. These toxins may accumulate and reduce proper functioning of the intestines, liver and kidneys - organs usually very adept at eliminating toxic products quickly and effectively. This clogging effect on the organs of elimination causes toxins to be excreted through the skin, leading to unpleasant and embarrassing body odour. Diet is another important factor affecting body odour. Certain foods, such as onion, garlic, spicy dishes, fried foods and coffee can dramatically, though temporarily, increase unpleasant body odour. People who are prone to body odour should avoid these types of food. In the long-term, poor dietary habits can also lead to constipation and micronutrient deficiencies - two other culprits of body odour. Excessive sweating and/or body odour are sometimes an indication of an underlying ailment including liver disease, metabolic disorders or periods of hormonal change like puberty or menopause. If you have experienced a sudden and persistent change in perspiration or body odour it is important to consult your health care provider to exclude an underlying medical condition. If there is no underlying medical cause for the problem of body odour, most people go through a process of looking for an antiperspirant or deodorant product that will rid them of unpleasant body odour. Underarm and foot deodorants or antiperspirants are popular options. Some people may try brand after brand to try to cure the problem though, of course, external products will not get to the root cause of an internal problem. These synthetic deodorants and antiperspirants are also not without their own health risks. Antiperspirants and deodorants contain substances like aluminum, polyethylene, talc and dimethicone. These chemicals have been associated with many health problems including Alzheimer’s, kidney disease and cancer. There is a lot that can be done naturally to help combat body odor. Try to avoid refined sugars in your diet as they can contribute to bad smells (and garlic especially!). Sweating is a great way to flush out toxins – so try to jog or sit in a sauna to promote sweating and detox. Alcohol and tobacco is known to contribute to bad body odor – so try to cut back or avoid smoking and drinking completely. 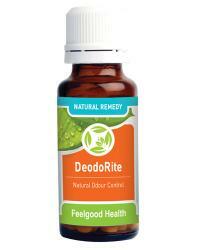 DeodoRite is a 100% safe and effective internal natural remedy for treating the underlying causes of body odour. The formula has been especially manufactured to improve the elimination of toxins from the body, promote healthy liver functioning and reduce excessive perspiration. Galium ape (D3) is an excellent homeopathic remedy with beneficial effect on the lymph system, which controls movement of fluid in the body and is also a mechanism of toxin clearance from the body. Carduus mar (D3) homeopathically this ingredient addresses liver problems. It also focuses on functioning of the liver as well as excretion of toxins. Toxins may contribute to bad body odour, making this an excellent component off the remedy. Silica (D6) Silica is also known as the 'homeopathic surgeon' due to its unique ability to cleanse the cells of toxins and rid the body of bad odours. Silica is naturally occurring in the body, especially in hair, nails, skin, nerve sheaths and all mucous membranes, including the mouth and digestive tract. Silica acts as a natural cleanser and purifier and will also eliminate all foreign matter in the body. For this reason Silica should not be used by individuals with any type of prosthesis, metal plates, pins or artificial tubes in the body. Cali sulph (D6) is a blood purifying tissue salt which is effective in clarifying lymphatic fluid, promotes efficient elimination of waste products and prevents deposits of toxins forming in the body. Calc. Sulph. has a cleansing and purifying effect throughout the system. Mag Phos (D6) is a tissue salt which maintains healthy digestive processes and improves efficiency of intestinal absorption - functions which are negatively affected by magnesium deficiency. Mag. Phos. is also known to keep the blood at a healthy, alkaline pH and is recommended alongside Calc. sulph. in the treatment of body odour. Merc sol (30C) is a homeopathic remedy effective in treating excessive perspiration as well as treating offensive body odours and bad breath. Lactose: inactive ingredient. DeodoRite is presented in small lactose tablets. The amount of lactose used is very small and is generally well tolerated even by people who are lactose intolerant. DeodoRite contains no gluten, artificial flavours, colours or preservatives. DeodoRite comes in small lactose-based sucking tablets. Taken regularly, DeodoRite will help to improve toxin elimination and prevent unpleasant body odour, while reducing excessive perspiration. Adults and Teenagers: Dissolve two tablets in a clean mouth three times daily. Children: Dissolve one tablet in a clean mouth three times daily. Caution: Due to its ability to eliminate toxins or foreign objects from the body, DeodoRite should not be used by people with internal prosthetic devices. NOTE: Wash body or affected areas (e.g. underarms, feet) with ClearSkin Daily Wash for extra control. Most people will experience improvement within the first few days of taking DeodoRite, though it may take 3-6 weeks to see the full effectiveness. One bottle of 125 DeodoRite tablets will last approximately 3 weeks (or 6 weeks at children’s dosage). Will DeodoRite help my smelly feet? Yes- DeodoRite is formulated to treat all unpleasant body odours and will cleanse your system of toxins and impurities that cause odours whether from the feet, underarms or anywhere else on the body. Perspiration and sweating is a natural and healthy process of regulating temperature as well as eliminating toxins from the body. Although preventing this process may sometimes help with body odour in the short term, it is only masking the problem and body odour will return with a vengeance as soon as the antiperspirant is stopped. Accumulated toxins in the body will, in fact, mean that body odour is worse after using antiperspirant for a period of time and then discontinuing it. Apart from this, synthetic deodorant and antiperspirant products generally contain a number of harmful and even carcinogenic substances that may damage your health. Bath or shower every day to cleanse your skin of excess bacteria- especially around the underarms, groin and feet. Avoid tight fitting clothes, especially those in synthetic fabrics that don’t allow your skin to breathe. Steer clear of garlic, onions, spicy food, cigarettes and coffee if you suffer from unpleasant body odour. As a natural and safe alternative to antiperspirant deodorants try wiping your underarms with witch hazel or apple cider vinegar. Otherwise, Bauxite crystal deodorants are available in most health shops and work well at controlling odour. Try to include as much parsley, wheatgrass and alfalfa in your diet as possible. The chlorophyll content of these plants is well-known in reducing body odour. Keep your body smelling fresh plus herbal face wash!